In the past, villages were a usual form of community for societies that practice subsistence agriculture, and also for some non-agricultural societies. In Great Britain, a hamlet earned the right to be called a village when it built a church. In many cultures, towns and cities were few, with only a small proportion of the population living in them. The Industrial Revolution attracted people in larger numbers to work in mills and factories; the concentration of people caused many villages to grow into towns and cities. This also enabled specialization of labor and crafts, and development of many trades. The trend of urbanization continues, though not always in connection with industrialization. "The soul of India lives in its villages," declared M. K. Gandhi  at the beginning of 20th century. According to the 2011 census of India, 68.84% of Indians (around 833.1 million people) live in 640,867 different villages. The size of these villages varies considerably. 236,004 Indian villages have a population of fewer than 500, while 3,976 villages have a population of 10,000+. Most of the villages have their own temple, mosque, or church, depending on the local religious following. In Afghanistan, the village, or deh ( Dari/ Pashto: ده)  is the mid-size settlement type in Afghan society, trumping the hamlet or qala ( Dari: قلعه, Pashto: کلي),  though smaller than the town, or shār ( Dari: شهر, Pashto: ښار). In contrast to the qala, the deh is generally a bigger settlement which includes a commercial area, while the yet larger shār includes governmental buildings and services such as schools of higher education, basic health care, police stations etc. Auyl ( Kazakh: Ауыл) is a Kazakh word meaning "village" in Kazakhstan. According to the 2009 census of Kazakhstan, 42.7% of Kazakhs (7.5 million people) live in 8172 different villages. To refer to this concept along with the word "auyl" often used the Slavic word "selo" in Northern Kazakhstan. In the Republic of China ( Taiwan), villages are divisions under townships or county-controlled cities. The village is called a tsuen or cūn (村) under a rural township (鄉) and a li (里) under an urban township (鎮) or a county-controlled city. See also Li (unit). In Brunei, villages are officially the third- and lowest-level subdivisions of Brunei below districts and mukims. A village is locally known by the Malay word kampung (also spelt as kampong). They may be villages in the traditional or anthropological sense but may also comprise delineated residential settlements, both rural and urban. The community of a village is headed by a village head ( Malay: ketua kampung). Communal infrastructure for the villagers may include a primary school, a religious school providing ugama or Islamic religious primary education which is compulsory for the Muslim pupils in the country,  a mosque, and a community centre ( Malay: balai raya or dewan kemasyarakatan). In Indonesia, depending on the principles they are administered, villages are called Kampung or Desa (officially kelurahan). A "Desa" (a term that derives from a Sanskrit word meaning "country" that is found in the name " Bangladesh"=bangla and desh/desha) is administered according to traditions and customary law ( adat), while a kelurahan is administered along more "modern" principles. Desa are generally located in rural areas while kelurahan are generally urban subdivisions. A village head is respectively called kepala desa or lurah. Both are elected by the local community. A desa or kelurahan is the subdivision of a kecamatan (subdistrict), in turn the subdivision of a kabupaten (district) or kota (city). The same general concept applies all over Indonesia. However, there is some variation among the vast numbers of Austronesian ethnic groups. For instance, in Bali villages have been created by grouping traditional hamlets or banjar, which constitute the basis of Balinese social life. In the Minangkabau area in West Sumatra province, traditional villages are called nagari (a term deriving from another Sanskrit word meaning "city", which can be found in the name like " Srinagar"=sri and nagar/nagari). In some areas such as Tanah Toraja, elders take turns watching over the village at a command post. [ citation needed] As a general rule, desa and kelurahan are groupings of hamlets (kampung in Indonesian, dusun in the Javanese language, banjar in Bali). a kampung is defined today as a village in Brunei and Indonesia. Kampung is a term used in Malaysia, (sometimes spelling kampong or kompong in the English language) for "a Malay hamlet or village in a Malay-speaking country". In Malaysia, a kampung is determined as a locality with 10,000 or fewer people. Since historical times, every Malay village came under the leadership of a penghulu (village chief), who has the power to hear civil matters in his village (see Courts of Malaysia for more details). A Malay village typically contains a "masjid" ( mosque) or " surau", paddy fields and Malay houses on stilts. Malay and Indonesian villagers practice the culture of helping one another as a community, which is better known as "joint bearing of burdens" ( gotong royong). They are family-oriented (especially the concept of respecting one's family [particularly the parents and elders]), courtesy and practice belief in God ("Tuhan") as paramount to everything else. It is common to see a cemetery near the mosque. All Muslims in the Malay or Indonesian village want to be prayed for, and to receive Allah's blessings in the afterlife. In Sarawak and East Kalimantan, some villages are called 'long', primarily inhabited by the Orang Ulu. Selo ( Cyrillic: село; Polish: sioło) is a Slavic word meaning "village" in Bosnia and Herzegovina, Bulgaria, Croatia, North Macedonia, Russia, Serbia, and Ukraine. For example, there are numerous sela (plural of selo) called Novo Selo in Bulgaria, Croatia, Montenegro and others in Serbia, and North Macedonia. 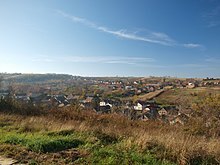 Another Slavic word for a village is ves ( Polish: wieś, wioska, Czech: ves, vesnice, Slovak: ves, Slovene: vas, Russian: весь). 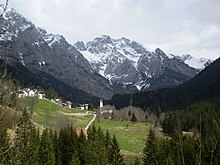 In Slovenia, the word selo is used for very small villages (fewer than 100 people) and in dialects; the Slovene word vas is used all over Slovenia. In Russia, the word ves is archaic, but remains in idioms and locality names, such as Vesyegonsk. In Russia, as of the 2010 Census, 26.3% of the country's population lives in rural localities;  down from 26.7% recorded in the 2002 Census. Multiple types of rural localities exist, but the two most common are derevnya (деревня) and selo (село). Historically, the formal indication of status was religious: a city (gorod, город) had a cathedral, a selo had a church, while a derevnya had neither. The historically Cossack regions of Southern Russia and parts of Ukraine, with their fertile soil and absence of serfdom, had a rather different pattern of settlement from central and northern Russia. While peasants of central Russia lived in a village around the lord's manor, a Cossack family often lived on its own farm, called khutor. A number of such khutors plus a central village made up the administrative unit with a center in a stanitsa ( Russian: стани́ца; Ukrainian: станиця, stanytsia). Such stanitsas often with a few thousand residents, were usually larger than a typical selo in central Russia. In Ukraine, a village, known locally as a selo (село), is considered the lowest administrative unit. Villages may have an individual administration ( silrada) or a joint administration, combining two or more villages. Villages may also be under the jurisdiction of a city council (miskrada) or town council (selyshchna rada) administration. The khutir (хутір) and stanytsia (станиця) are not part of the administrative division any longer, primarily due to collectivization. Khutirs were very small rural localities consisting of just few housing units and were sort of individual farms. They became really popular during the Stolypin reform in the early 20th century. During the collectivization, however, residents of such settlements were usually declared to be kulaks and had all their property confiscated and distributed to others ( nationalized) without any compensation. The stanitsa likewise has not survived as an administrative term. The stanitsa was a type of a collective community that could include one or more settlements such as villages, khutirs, and others. Today, stanitsa-type formations have only survived in Kuban ( Russian Federation) where Ukrainians were resettled during the time of the Russian Empire. A commune is considered as a village if it is not part of a ville (urban unit). For the Insee, an urban unit has more than 2000 inhabitants living in buildings less than 200 metres from each others. An independent association named Les Plus Beaux Villages de France, was created in 1982 to promote assets of small and picturesque French villages of quality heritage. As of 2008, 152 villages in France have been listed in "The Most Beautiful Villages of France". The major factors in the type of settlement are: location of water sources, organisation of agriculture and landholding, and likelihood of flooding. For example, in areas such as the Lincolnshire Wolds, the villages are often found along the spring line halfway down the hillsides, and originate as spring line settlements, with the original open field systems around the village. In northern Scotland, most villages are planned to a grid pattern located on or close to major roads, whereas in areas such as the Forest of Arden, woodland clearances produced small hamlets around village greens. Because of the topography of the Clent Hills the north Worcestershire village of Clent is an example of a village with no centre but instead consists of series of hamlets scattered on and around the Hills. There should be a clear green belt or open fields, as, for example, seen on aerial maps for Ouston surrounding its parish  borders. However this may not be applicable to urbanised villages: although these may not be considered to be villages, they are often widely referred to as being so; an example of this is Horsforth in Leeds. Syria contains a large number of villages that vary in size and importance, including the ancient, historical and religious villages, such as Ma'loula, Sednaya, and Brad (Mar Maroun's time). The diversity of the Syrian environments creates significant differences between the Syrian villages in terms of the economic activity and the method of adoption. Villages in the south of Syria ( Hauran, Jabal al-Druze), the north-east (the Syrian island) and the Orontes River basin depend mostly on agriculture, mainly grain, vegetables, and fruits. Villages in the region of Damascus and Aleppo depend on trading. Some other villages, such as Marmarita depend heavily on tourist activity. 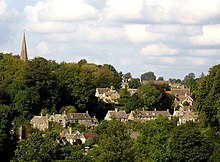 In twenty  U.S. states, the term "village" refers to a specific form of incorporated municipal government, similar to a city but with less authority and geographic scope. However, this is a generality; in many states, there are villages that are an order of magnitude larger than the smallest cities in the state. The distinction is not necessarily based on population, but on the relative powers granted to the different types of municipalities and correspondingly, different obligations to provide specific services to residents. In Maryland, a locality designated "Village of ..." may be either an incorporated town or a special tax district. An example of the latter is the Village of Friendship Heights. Even though the constitution of the Federal Republic of Nigeria has not recognised the functions of traditional rulers, they still command respect in their villages  and political office holders liaise with them almost every time to reach people. Village dwellers in the Southeastern region lived separately in "clusters of huts belonging to the patrilinage". As the rainforest region is dominated by Igbo speaking people, the villages are called ime obodo (inside town) in Igbo language. A typical large village might have a few thousand persons who shared the same market, meeting place and beliefs. ^ "Archived copy". Archived from the original on 13 November 2013. Retrieved 14 March 2014. CS1 maint: Archived copy as title ( link). ^ Adesiyun, A. A.; Adekeye, J. O.; Umoh, J. U.; Nadarajab, M. (1983). "Studies on well water and possible health risks in Katsina, Nigeria". The Journal of hygiene. 90 (2): 199–205. doi: 10.1017/S0022172400028862. PMC 2134251. PMID 6833745.